Actor and Writer – My life as both | AUTHOR. ACTOR. SWORDSMAN. ← Rebel’s early release: Shock on ferry! Since JACK ABSOLUTE relauched in the States last week, he has been bothering my mind. To the extent that I left my desk and the Great Plague and I searched my bookshelves for the script I used when I played Jack Absolute in Sheridan’s ‘The Rivals’ for the Oxford Playhouse Company, touring England from the Autumn of 1986 to Spring 1987. In it I discovered the notes I made at the time – both during rehearsals, and later when I developed the role in performance. Now I marvel at how fresh it all seems. It was a wonderful time. I’d returned from Los Angeles not long before, having decided that my dream of living and working there was, in reality, not what I wanted at all, nor where I wanted to be. I didn’t want to be an American TV actor. I desperately needed to return to my roots in the theatre, to really find myself again as an actor – I’d been playing the Hollywood game too long. I’ve always felt that my true theatrical form was 18th Century comedy – give me thigh boots and a sword and I’m your man! 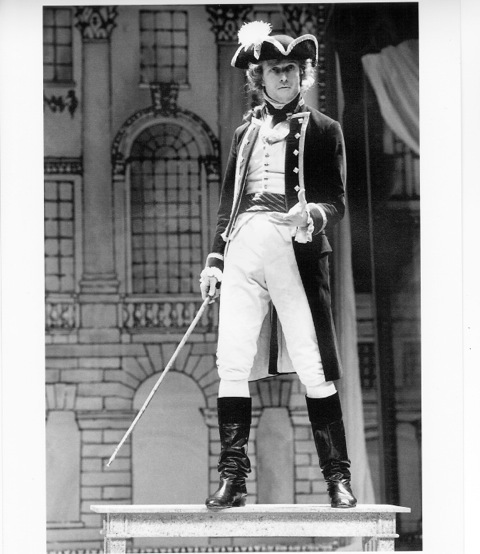 So when I found out that a director I knew a little was casting The Rivals – and I remembered seeing a performance of the play once and coveting the role of Jack Absolute – I got in touch, auditioned, got the part. The Heights of Abraham? Well, in the prequel to the first novel, (out in the US later this year “The Blooding of Jack Absolute” my young hero does exactly that: is one of the first soldiers up the cliffs at Quebec, paving the way for the British victory over the French that gave them North America. Ah, its fun to look at the script and revisit my 31 year old self! It’s as much fun to consider where the ‘playscript notes’ took me: around the world, researching every aspect of period and place; around the world now ‘by blog’, connected once again, differently, with my boy Jack. You’ll find a lot of actors who mourn a role’s ending. Sometimes they mourn with the bottle. I think I found a better, healthier way: write novels about my favourite character and live him still. This entry was posted in Uncategorized and tagged historical fiction, Inspiration, novels, publishing news, theatre, Writing. Bookmark the permalink. You make a dashing Jack Absolute! How nice that you can relive such triumphs in various forms of media and have so much fun doing it. BTW, saw the new cover of JA while traveling in California, and it’s quite smashing!